Within the next few decades, Big Meat and Big Dairy could surpass Big Oil as the world’s biggest climate polluters, a new study by non-profit GRAIN and the Institute for Agriculture and Trade Policy (IATP) showed on Wednesday. The world’s biggest animal protein producers could soon surpass ExxonMobil, Shell, and BP as the largest contributors to climate pollution, according to the study. IATP and GRAIN jointly published the study that quantifies emissions from 35 of the world’s largest meat and dairy companies and reviews their plans to fight climate change. 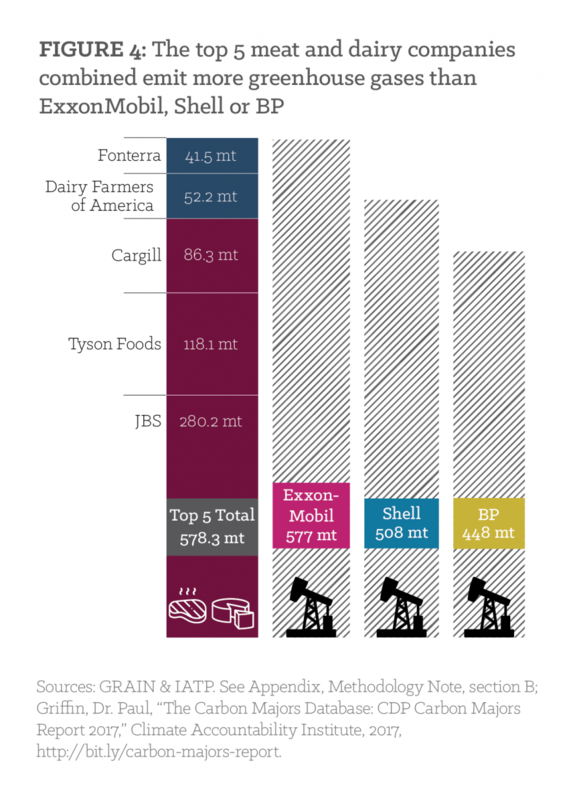 The report found out that the five largest meat and dairy corporations combined - JBS, Tyson, Cargill, Dairy Farmers of America, and Fonterra - are already responsible for more annual greenhouse gas emissions than ExxonMobil, Shell, or BP. According to one figure in the report, the combined emissions of the top five companies are on par with those of Exxon and significantly higher than those of Shell or BP. Moreover, the report also found that the combined emissions of the top 20 meat and dairy companies surpass the emissions from entire nations, such as Germany, Canada, Australia, the UK, or France. Most of the top 35 meat and dairy companies either fail to report emissions entirely, or exclude their supply chain emissions, which account for 80-90 percent of emissions, according to the study, which pointed out that only four of the 35 biggest companies provide comprehensive emissions estimates. In addition, less than half of the top 35 meat and dairy companies in the world have announced any type of targets to reduce emissions. “If the growth of the global meat and dairy industry continues as projected, the livestock sector as a whole could consume 80 percent of the planet’s annual greenhouse gas budget by 2050,” the report said. “The climate community’s attention has been focused on fossil fuel companies. It is time we broadened our focus to include the meat and dairy majors. In the next ten years, we must work together to build a just transition of our agricultural economy that helps restore rural communities and our soil, and sustain our planet,” IATP said.